May looks like being a good month for ferries. Hot on the heels of the 4th weekly Blue Star announcement for the month of May comes the first few days of ANES Ferries “Sebeco” for the season. There had been doubt about whether Sebeco would operate Rhodes-Symi this summer, but here she is, with times released up to 8th May. Now, ANES, tell us what you’re doing for the rest of May and indeed the rest of summer, as soon as you can. Because Symi is an island that really requires advance booking by tourists, they want to know when they can get there, especially since last year (and this year judging by the times released so far) Sebeco had/will have the much requested morning sailings from Symi and afternoon sailings from Rhodes on most days – and a mooring point in Symi right by the bus station. Here’s the combined ferry timetable for May – note that Sebeco times only run till the 8th of May, hopefully later dates will follow soon. 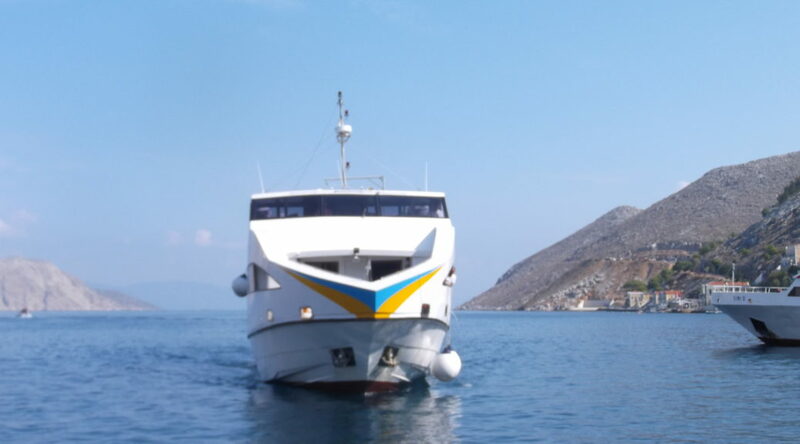 Blue Star have announced an additional service during May, providing a Symi-Rhodes 07:40 morning and Rhodes-Symi afternoon 17:00 sailing on Sundays during May. These are extra calls on the fast Saturday evening departure from Piraeus to Kos and Rhodes only, and the Sunday evening Rhodes-Kos-Piraeus service. Passengers can of course use them to get to/from Kos or Piraeus as well as Rhodes. Will this continue after the end of May? It isn’t clear at all, some cynics on Symi are connecting the extra sailing with the timing of the municipal, European and (maybe) Greek national elections. Others say that the Ministry of Marine and Aegean Affairs civil servants are unwilling to authorise extra sailings in June and later when the Minister and Deputy Ministers are highly likely to change either as a result of elections or a pre-election reshuffle. There’s no meeting of the Coastal Shipping Council scheduled (which would provide cover for the civil servants if it happened). There are several Scandanavian countries which send a high volume of flights into Rhodes on Sundays in summer and this may be useful for tourism if it does continue. Most shops in Rhodes are open on Sundays in summer so shopping trips for Symi residents would also be possible, though the sailings don’t help with medical appointments and meetings with lawyers, accountants, tax offices etc. Here are the flight tables for summer service from Italy to Rhodes and Kos. Note that Milan Linate airport closes for maintenance from late July for the rest of the summer, and Alitalia flights to Rhodes switch departure point to Malpensa as a result. I’d like to acknowledge the website Rhodes Airport Aviation News which enabled me to make sense of Alitalia’s timetable – certainly Alitalia’s website doesn’t. Here are the flights tables for services from Denmark, Finland, Sweden, and Norway to Rhodes and Kos for this summer. The Thomas Cook and TUI flights are all charters, only one, two or three week bookings, and no one-way tickets. Why, I don’t know. There are no legal restrictions, the whole route is within the European Common Aviation Area. The two groups of companies have subsidiaries in other European countries that sell seats for longer periods or just one-way, so they already own the software to handle it. Some holes in the service from Denmark after the collapse of Primera last year. After some delay, here’s the 2019 flight schedule from the Netherlands to Rhodes and Kos. Both Corendon and TUI Netherlands were expecting deliveries of Boeing 737MAX planes in time to help in high season, that seems less likely now, so alterations are to be expected. More flight schedules to follow later in the week.